This is the newest invention from Nuxe. A product made for all ages! The answer to the fountain of youth. No matter what our age is our cells weaken and get worn down daily. Our skin loses energy just like your car loses gas when driving too much! Our skin needs to receive energy. We all have mitochondria in our skin cells; this is energy to our skin. Mitochondria make sure that our skin cells function correctly. The DNA of the cell nucleus is stronger than the mitochondria which breaks down faster.Nuxe discovered that passion flower, poppy and Anchusia works on the activity of the mitochondria DNA repair. After using Nuxellence for a period of four weeks: you can see wrinkles and lines are diminished. You can see your skin is re-plumped. Youthful radiance is restored. Your skin looks smoother and more radiant. A miracle serum has just been created! How to use: pump 2 to 3 pumps to cover neck and entire face. Use 2 times daily: morning and night. When applying start in the center of your face and use in upward motion. This serum fluid is very light and absorbs into skin quickly, so you may use your regular skincare over Nuxellence. The way that the bottle is made is so easy and you can’t overuse. 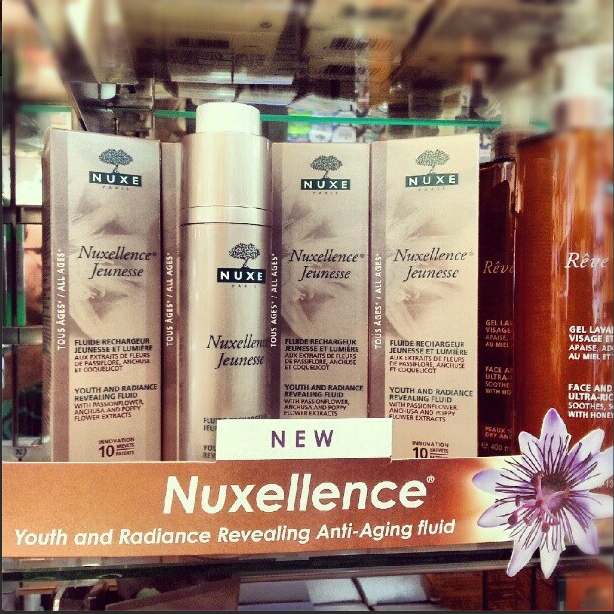 Come to Thompson Alchemists or Thompson Chemists and try Nuxellence today!